Please enter the following information so we can match to your donation records. If you are a first time donor, you can still create an account, but will not have access to all of the site's features. We are unable to give Donor ID numbers via phone or email. If you do not know your Donor ID Number, create your account without it. Once you have done that, send an email to info@shepeardblood.org or call us at 706-737-4551. We will get your account linked with your Donor ID Number. You will receive an email once your account is linked. 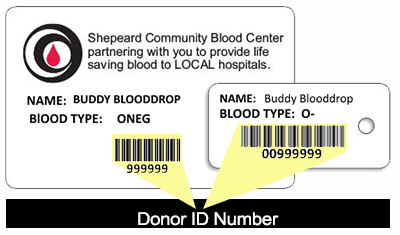 Please Note: Your donor number can be found on the back of your donor card, below the bar code. If your donor number begins with a zero or a series of zeros, please OMIT the zero(s) and enter your donor number beginning with the first actual number. READ MESSAGE BELOW BEFORE PROCEEDING!! Once all the above fields are completed, your account is now ready to be registered. Can be no more than 20 characters. Must be at most 32 characters. Our donor app is available now on Android and iOS!